So sorry! But maybe I'll visit someday! Mandaleighta, how'd you guess my backup plan??? Mum, you can come too, don't worry. Oh my wow, that's a nice place!!! What a great life plan ... a little impractible :) but it sounds fabulous. I might have to join you at work though, that office looks amazing. You can make the coffee and i'll clean the windows. Oh. Yay. But what about my newly found kittens? So, does this mean I can come live with Alex in the newly-minted bachelor digs? We could go and hang out at all the cool spots in Chi-town, catch some ball games, go to Navy Pier (HAR! ), and do...you know, "guy stuff". That office looks like a giant human habitrail. :) Though I have to say you can't beat the natural light in it! 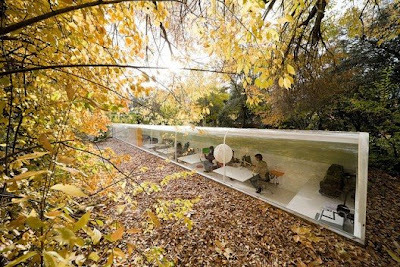 :) I'd love to have a studio like that! dream big, I always say. sounds like fun! need a room mate? lol. Hi, I am from Brazil ,I love your blog, I have a blog on tb craft in general and now I'm offering my readers to download the magazine found the net, http://agulhaetricot.blogspot.com, visit me, and also appears in my online shop Maison Carré by Tita, http://maisontitacarre.blogspot.com, kiss. 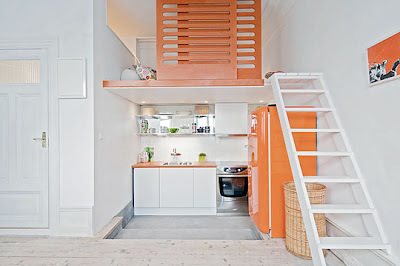 That's too funny.. the moment I saw the orange flat in Stockholm on AT, I was going to send the pic to you! whatever you do don't take a job washing the windows there - doesn't look like fun! That is so futuristic looking and fun! I wanted to tell you that I’m hosting an incredible giveaway for a $195 EZ View Desktop on my blog. Come on over and enter! I have something for you over on my blog, if you want to come and get it! Can I come with you? I love all of those spaces! I like you're new life plan. :) Your posts always inspire me and make me laugh. Thanks! wow, can I come? I might stay in that office, what a wonderful place to work! Too funny! But I wanna sleep downstairs when I visit. I'd prolly roll right out of that loft! No problem. We can have a slumber party in the living room, and then you'll be safe. And Dede, I will bring some Midol with me. If there was a career in creating life plans for others you would have been the guru of the life planers! 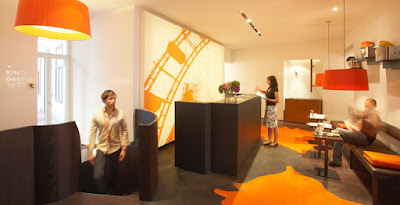 Although, I personally dont like orange that much but these decors are relly chic, contemporary and beautiful. Typical Swedish architecture and design, almost everyone has white walls and parquet flooring here. Have you seen that we also got an ice hotel in the north of Sweden? It's crazy! Ice hotel?? I will have to look this up. ..you can imagine how cold it is up here in winter... but now it's +25C ! Have a lovely summer.